Here are video demonstrations of rupture resolution illustrating the principle of metacommunication. They are based on actual rupture events experienced by the investigators who play the therapist or their students who play the clients. To promote authenticity and spontaneity, the interactions were not scripted; only the initial rupture marker and case formulation were discussed in advance. Many of the demonstrations were first takes. Confrontation Vignette 1: "This is a waste of time"
Confrontation Vignette 2 : "Where the rubber meets the road"
Confrontation Vignette 3: "My way or the highway"
Withdrawal Vignette 1 : "I'm sorry"
Withdrawal Vignette 2 : "You're giving me wonderful advice"
Mixed Vignette 1: "I'm not getting anywhere"
Mixed Vignette 2: "Can't touch that"
﻿﻿﻿﻿﻿﻿﻿Mixed Vignette 3﻿﻿﻿﻿﻿﻿﻿: "Gun shy"
Mixed Vignette 4﻿﻿﻿﻿﻿: "It's hard to say goodbye"
Muran, J.C., Safran, J.D., Eubanks-Carter, C. (2010). 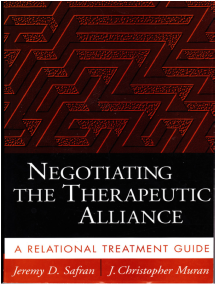 Developing Therapist Abilities to Negotiate Alliance Ruptures.